Acorn Cottage in Knutsford sleeps 4 people. Acorn Cottage in Knutsford is set in the grounds of the owner’s home and with private gated access; Acorn Cottage is perfect for couples and families wanting to experience all that Cheshire and its neighbouring counties have to offer. 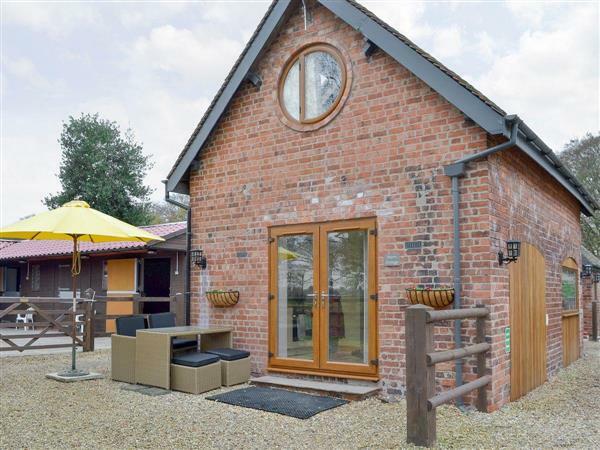 This former detached barn, which originally dates back to the 1700s, has been transformed into a comfortable holiday home and offers Wi-Fi and a Smart TV. Surrounded by 5 acres of unspoilt countryside, the property has lovely rural views towards Jodrell Bank which can be enjoyed from the sitting-out area. With the owner’s horses in the adjacent paddock, it really is the perfect base for those seeking an escape to the country. This is a great area for walking and cycling, as there are two public footpaths within 220 yards of the property as well as plenty of other walking opportunities further afield, including the Peak District National Park which can be reached in 30 minutes by car. Other nearby outdoor activities include golf, fishing and horse riding. For those who fancy something a little more adventurous, there is ice skating and roller skating in Middlewich, 8 miles, motor racing at Oulton Park, 16 miles, or Go Ape at Delamere Forest Park, 15 miles. Acorn Cottage is situated just 2 miles away from Knutsford, one of Cheshire’s most popular towns, which has a great selection of shops, bars and eateries as well as a cinema. Popular with local celebrities and footballers, the villages of Hale, Mobberley and Alderley Edge also offer dining opportunities and with a wealth of country gastro pubs all over Cheshire, including some that have a Michelin star, so you really will be spoilt for choice. There are also lots of country houses and gardens in the area including Capesthorne Hall, 6 miles, and the National Trust’s Tatton Park, 5 miles, which both host a variety of events and concerts throughout the year. This is also a great touring base with Chester, 32 miles, and Liverpool, 34 miles, whilst an hour’s drive takes you into Shropshire and north Wales. Alternatively you may choose to leave the car behind and take a train from Knutsford into Manchester or Chester. Families with children will enjoy a visit to Chester Zoo, 30 miles, Blue Planet Aquarium, 28 miles, and Alton Towers, 34 miles. There is also an ice cream farm at the end of the road and the Allostock Miniature Railway is just 4 miles away from the cottage. The shop and restaurant are 2 miles, with the pub being ½ mile from Acorn Cottage in Knutsford. Acorn Cottage has a step to entrance. Living area: With 43 Freeview Smart TV and wooden floor. Kitchen/dining area: With breakfast bar, electric oven, electric hob, microwave, fridge/freezer, dishwasher, washing machine, tiled floor and French doors leading to sitting-out area. Bedroom 1: With king-size bed. Electric central heating, electricity, bed linen, towels and Wi-Fi included. Sitting-out area with table. Bike store. Private parking for 2 cars. No smoking. Holidays at Acorn Cottage run from Friday to Friday. For a better idea of where Acorn Cottage is, you can see Acorn Cottage on the map below. Acorn Cottage is in Cheshire; should you be on the lookout for a special offer, you can find all the special offers in Cheshire. It's always worth checking to see what is on offer at the moment. Do you want to holiday near Acorn Cottage (UKC805), you can see other cottages within 25 miles of Acorn Cottage; have a look to find your perfect holiday location.